Yesterday was the Spring Equinox for those of us in the Northern Hemisphere. Before we get busy with the activities of spring, perhaps we should ensure that we got proper rest and recuperation during the winter. Winter weather, though folks like to complain about it, is key to getting us to slow down and rest. Yet, this season (in our area, at least) had some nasty viruses that really wore people down. Do you need an extra rest before taking on spring and summer? Be kind to yourself. Meaning: Granville’s engraving of Marshmallow shows the flower herself ministering to the needs of an invalid frog. She is assisted by another elderly marshmallow. There are bottles and jugs in the background and in the foreground a concerned insect looks on. 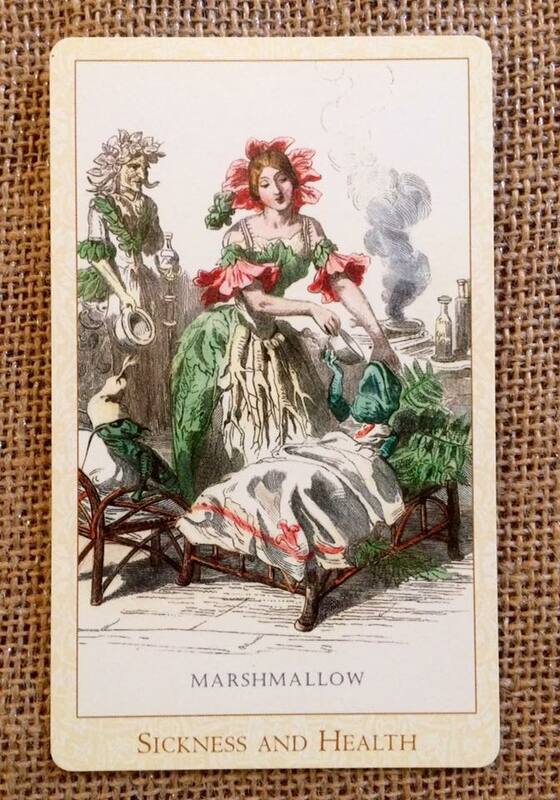 Grandville clearly knew of marshmallow’s medicinal uses. Though the image is of a sick animal, we see clearly that he is in a warm bed and being cared for. If you draw this card, remember that this is not, ultimately, a negative image. No one likes being ill, but this scene shows the frog being well looked after. This card may not point to a clinical illness at all – it could indicate a general malaise or a world weariness or just the need for some rest. Essentially, we need to know that when we aren’t feeling our best, there is someone to care for us. It’s a sip of water or some gentle words may be as necessary for our well-being as actual medicine or treatments. Sometimes we, or those around us, need the services of a doctor, nurse, or therapist. Other times it’s we, ourselves, who need to take the role of care. This card asks us to think of the good, as well as the bed, aspects of illness. Well it’s something that I was welcome in our lives, it has the potential to bring out the best sides of our nature’s. When sickness is supported with love, care, and compassion, you can go a long way to making the experience easier.